Visiting Sävö, you will see fields that are being cultivated every year, and meet sheep and cows moving freely on the island. Being the leaseholders of Sävö from The County Administrative Board of Sörmland, our task is to run a small scale farm with grazing animals. Our sheep are being kept on the island year-round. Until 2017 we kept the breed ”Svensk finull”, an old Swedish breed with soft, fine wool popular for crafting. 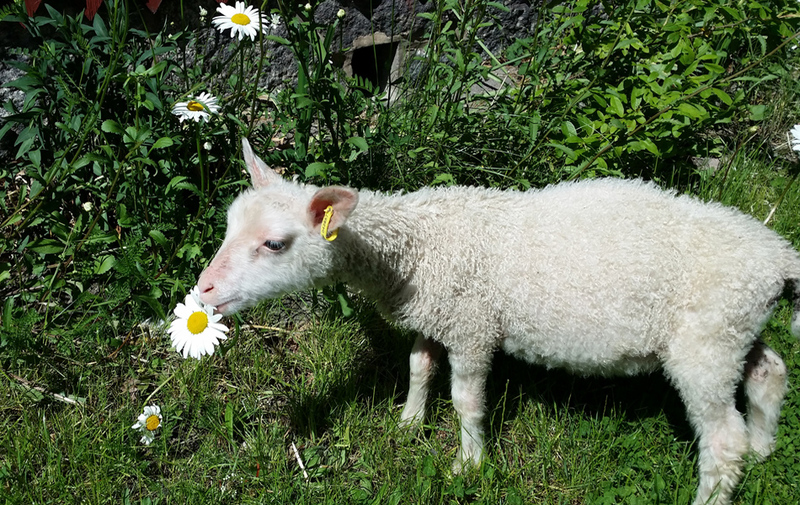 After that we gradually started to change to ”pälsfår”, a breed more accustomed to the lean pastures on an island. “Pälsfår”, in addition to giving meat, also supply nice, gray sheepskins. Around 25 ewes walk in-and out of the barn as they please, but lamb inside during April. They then spend summer outside and if the lamb grow well they are ready for slaughter in autumn. We send the animals to Rinkeby slaughterhouse in Jönåker and receive boxes of meat which we sell and then distribute at the meat shop at Bergs Farm. The cows, or young stock, pasture on the island and are, like many others, summer guests in the archipelago. We transport them with the “cow-ferry” in the middle of May and return them in October. We do not have enough room or fodder to keep them over winter. The young stock come from Bergs Farm. It is beneficial to keep various kinds of animals on the pastures as they prefer different kinds of plants. The sheep are gourmets and pick the finest straws of grass on dry grounds. They are also good at grazing leaves. The young stock are more like vacuum cleaners and eat everything. They do not mind getting wet and can be seen in the water, eating reeds. Unfortunately, the sheep gladly eat mushrooms and the cows like blueberries. An explanation as to why we pick our blueberries on the mainland. We harvest our own fodder from the fields on the island. We have our own machines and make around 100 large round bales of silage each year. Silage is grass which is conserved by being compressed and stored in air-tight plastic. Our machines are old but do the job even though not always in a very efficient way. There can be quite a lot of fixing the machines involved during the harvesting. 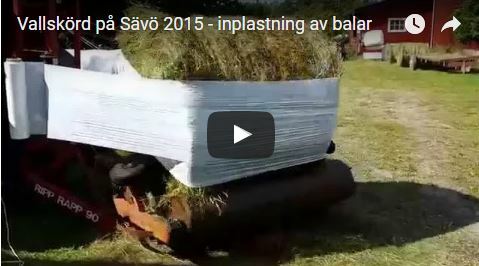 A small-scale farm in the archipelago can not afford big costs on modern machines. Furthermore, we want small, light machines that can be transported between islands on the “cow-ferry”. On the island we have two tractors, mower, tedder, baler, and a bale wrapper. We would not have had all these machines if our farm had been on the mainland. There it would have been cheaper to hire someone for the small harvest. Agriculture always include lots of transportation, being on an island make these more of a challenge. There are many things that have to work in order for transports to run smoothly on the island, over water and on the mainland. It usually works out but it is impossible to estimate how much time it is going to take as it all depends on winds, ice and connecting transports. The purpose of agriculture on Sävö is to preserve the farmland. Obviously this is not viable, and would not be possible without economic support from The Rural Development Programme financed by the Swedish Government and the EU. It is possible to apply for compensation for care of pasture, forest pasture, and fields. Yearly, we put approximately half a year worth of working hours into to agriculture on Sävö and some small tasks for The County Administrative Board.